Welcome to another wonderful Kindle Fire Touch Giveaway. This time, it's brought to you by Pregnancy Forum & Joys of Life. 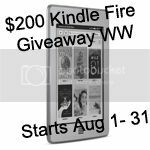 Have you been able to capture one of the many Kindle Fires in these giveaways yet? I know I haven't! LOL, but these sure are great to have. Check out the specs below. Display: 600 x 800 pixel resolution at 167 ppi, 16-level grayscale. Size (in inches): 6.8" x 4.7" x 0.40" (172 mm x 120 mm x 10.1 mm). Weight: 7.8 ounces (220 grams). Battery Life: A single charge lasts up to two months with wireless off based upon a half-hour of daily reading time. Keep wireless always on and it lasts for up to 3 weeks. Battery life will vary based on wireless usage, such as shopping the Kindle Store, downloading content, and web browsing (browsing available only in Wi-Fi mode). Charge Time: Fully charges in approximately 4 hours via the included USB 2.0 cable connected to a computer. Power adapter sold separately. Wi-Fi Connectivity: Wi-Fi networks or hotspots that use the 802.11b, 802.11g, or 802.11n standard with support for WEP, WPA and WPA2 security using password Wi-Fi networks. Included in the Box: Kindle wireless e-reader, USB 2.0 cable, and Quick Start Guide. I have been wanting one of these forever! Plus, my 4 year old son has been wanting something like this too, so it would be great to have one that we could share! I'd love to get one for my husband, esp. when he travels for work I think he'd really love it. Plus, I could use it when he is at work and need a book break away from the kids and chaos! My family and I have been wanting one of these since they came out, but they're a bit too pricey so unless I win, we won't be getting one. I've wanted a Kindle Fire for a long time! I love to read, but my eyes can't handle it and I can barely read the print. I love that with the Kindle Fire, you can adjust the print size to what you want and you can read in bed without having a light on because of the back-light on the Kindle. Plus, reading in bed without having to flip pages would be a big plus! I would love to win a Kindle Fire for my mom! She loves reading, and would really like one! I would love this! The print size adjusting is what I need for reading for sure! I would love to win a Kindle Fire because I do not own one and I travel to visit my Mom quite often. Would be great to have it to read on the train. I would give it to my mom for her birthday gift.